A natural bleach, lemon is high in citric acid that exfoliates the skin by opening up its pores and removing dead cells that cause discoloration of the skin. When citric acid is applied regularly, it consistently triggers the growth of new cells that improves the appearance of the skin and evens out the complexion. Alpha Hydroxy acids posses the ability to separate dead cells that cling onto the new skin cells, and citric acid is one of them. Furthermore, lemon contains a high amount of Vitamin C that is one of the most powerful natural antioxidants. Not only does it further exfoliate the skin, the ascorbic acid in Vitamin C decreases the production of melanin (dark brown or black pigment that occurs in the skin, hair and the iris of the eye in animals and human beings) and protects it from photo aging and the harmful effects of UV rays. Salt contains anti-inflammatory properties that soothe the aggravated skin and the olive oil helps hydrate and moisturize it further. Take 2 tablespoons of freshly squeezed lemon juice, 1 tablespoon of olive oil and 1/2 a cup of table or sea salt in a small bowl and whisk them together. Follow the treatment once every day until you achieve the desired results. Yogurt contains lactic acid that has numerous bleaching properties. The antimicrobial alpha hydroxy acid in yogurt promotes the growth of new skin cells. It also increases collagen and elastin in our skin, thereby tightening skin and improving its appearance. Further, vitamin E in yogurt nourishes the skin by soothing and softening the dry skin on your elbows and knees. 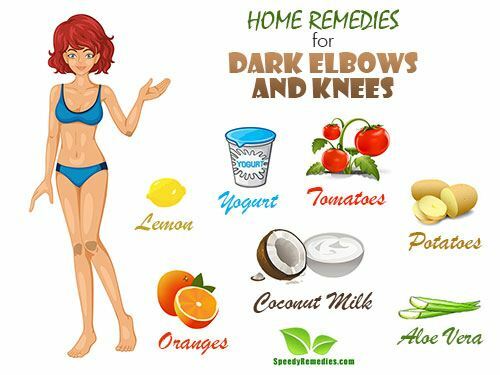 Dark elbows and knees are also a result of deficiency of calcium in the body leading to discoloration and uneven patches on the skin. Yogurt is an incredible source of calcium that fights discoloration and contains antioxidants. The antioxidants fight cell-damaging free radicals and promote repair and regeneration of dry, dull skin. Gram flour is an excellent exfoliating agent and works well with yogurt to fight the accumulation of dead skin cells and reduce discoloration. This remedy can be used every day until results start become apparent. Add 2 tablespoons of gram flour to yogurt and whisk together. Rub the mixture onto the elbows and knees in a circular motion for 10 to 15 minutes. Rinse the mixture off your elbows and knees, pat them dry, and apply moisturizer. Tomatoes contain Lycopene, an antioxidant and a carotene responsible for their colors, that helps in protecting the skin from cell-damaging free radicals and propels the growth of new cells. Tomatoes also block harmful UV rays that are responsible for extreme skin discoloration and dryness. Further, the topical application of lycopene inhibits the function of ornithine decarboxylase, an enzyme that protects cellular DNA of the skin cells when harmful rays affect the skin. Moreover, tomatoes are also a rich source of Vitamin C which is anti-melanogenic and thus reduces the levels of melanin in the skin. A blend of tomatoes and avocados works amazingly well to reduce skin discoloration and pigmentation. Avocados are rich in vitamins A, E and C that help in reducing melanin and brightening skin. Wash it off with lukewarm water, pat the areas dry and apply moisturizer. Follow the remedy once every day until you achieve your desired results. Potato is another effective treatment for diminishing the discoloration of your dark elbows and knees. Potatoes work as a bleaching agent to treat discoloration and pigmentation on your skin. Potatoes contain catecholase, an enzyme that works to reduce unhealthy, dark appearance of your knees and elbows. Moreover, potatoes are rich in starch that works as an incredible exfoliating agent and sloughs off dead skin cells that obstruct the growth of new skin cells. Potatoes also contain vitamin C that further restricts the production of melanin in the skin preventing discoloration or pigmentation. Add the blended potatoes to a tablespoon of fresh yoghurt. Wash it off with water, pat the areas dry and moisturize them. Follow the treatment once every day until results start to show. Power-packed with antibacterial, antiseptic and antioxidant properties, aloe vera gel is a renowned remedy for treating dark skin. Aloe vera contains vitamin E and C, antioxidants and beta-carotene, all of the compounds that work together to promote the growth of new skin cells and thus diminish dull, hard and irritated skin on your elbows and knees. Aloe vera also contains polysaccharides, substance that helps get skin rid of stubborn dead cells which hinder the regeneration of new cells and lead to unhealthy discoloration of those areas. Furthermore, elbows and knees that get sunburnt take longer to heal and can even pain sometimes. Aloe vera contains glycoprotein that has anti-inflammatory properties, which not only improves the appearance of the skin after sunburn, but also soothes and heals the affected area. Take one aloe vera leaf and cut it sideways with a knife to extract its gel. Apply on your knees and elbows in a circular motion, spending 10 minutes on each elbow and knee. Wash the gel off with water, pat yourself dry, and apply moisturizer. Follow once every day for 2 to 3 weeks to get rid of dryness and discoloration. Coconut milk is one the richest sources of Vitamin C. It fights the free radicals in our skin, protecting the skin cells, and propelling their regeneration. Thus, coconut milk helps delay the aging process and prevents skin discoloration caused by dead cells. Moreover, coconut milk is rich in proteins that provide nutrition to the skin, keeping it healthy, glowing and supple. It hydrates the skin and improves its appearance drastically. Take one cup of coconut milk and add half a cup of rosewater to it. Wash the mixture off and pat yourself dry. Note: Milk and rosewater both contains amazing hydrating properties, so this remedy does not require any further moisturization. Oranges are rich in citrus, a bountiful source of antioxidants that helps in battling cell-damaging free radicals in the skin that obstruct the repair and re-growth process necessary to keep the skin healthy, young and tight. It removes the dead cells that accumulate over time, causing the skin to harden, darken, and become itchy and irritable. Moreover, it promotes the production of collagen and elastin (proteins found in the connecting tissues of the skin) which further maintain the skin’s vigor. Take three oranges, peel them, and put the peels out to dry. Add to a bowl of whole milk to form a paste. Wash the paste off with water, pat yourself dry and apply moisturizer. Note: Always dry the peel of an orange in the shade, and never under the sun, as that robs it of its antioxidant properties. Apply ample amounts of sun block before you leave the house. Opt for a sunscreen with high SPF for your elbows and knees. Keep your elbows and knees hydrated. Apply lotion to these parts generously. Take special care of doing so after a shower as that when skin is most in need of hydration. While taking a shower, use pumice stone on your elbows and knees to further slough off the dead cells that cause hardening and discoloration of the skin.